I first shared this Slow Cooker Chicken a la King recipe on Spend with Pennies where I am a contributor. 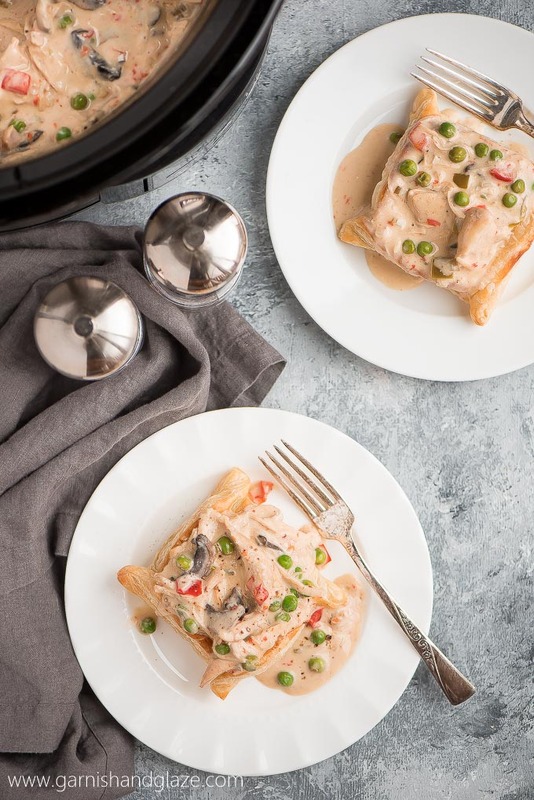 Slow Cooker Chicken a la King Puff Pastry is a creamy and comforting classic dish made simple but still pretty enough to serve to dinner guest. Back in college I majored in dietetics and one of our classes was running a cafe on campus. We had to do the cooking, cleaning, managing… It was a 6 hour class twice a week. It seems like forever ago so I don’t remember tons but I do remember eating the yummy food. 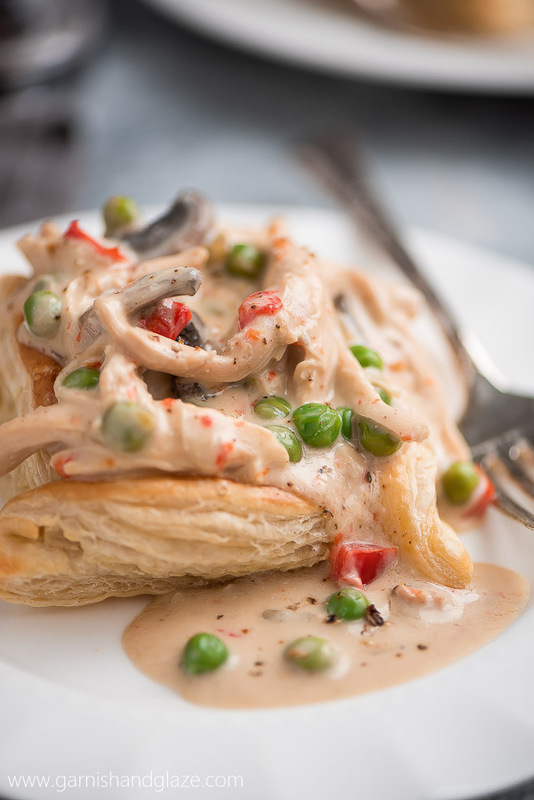 One of the dishes we served was a chicken puff pastry. 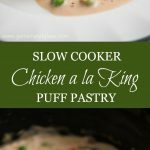 I failed to grab the recipe for it but this Slow Cooker Chicken a la King Puff Pastry sure comes close to what I remember. 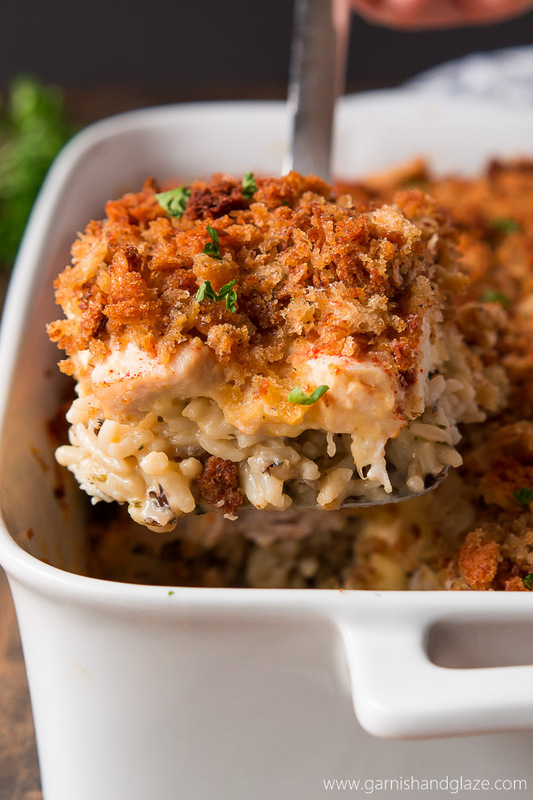 Slow cooker recipes are the best! I love how most of the work is done up front. 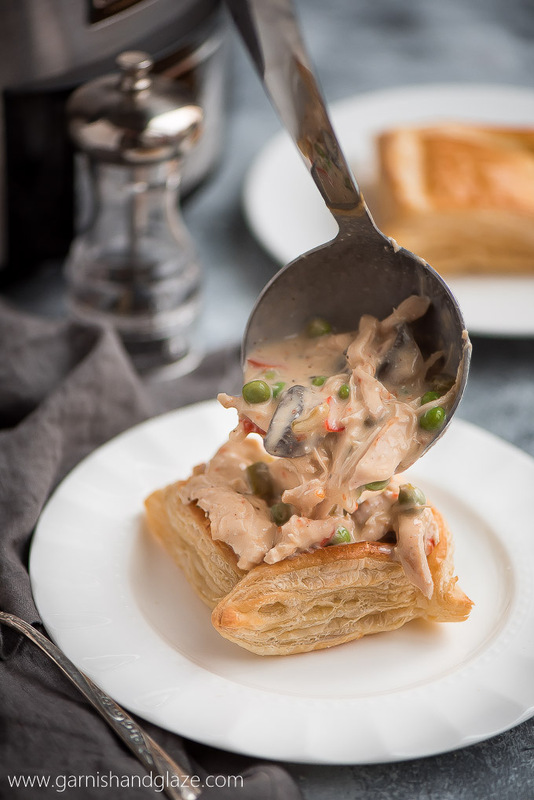 For this Slow Cooker Chicken a la King Puff Pastry you toss almost everything in the pot and let it do its thang. For the last 30 minutes you add a few more ingredients, pop the puff pastry in the oven and boom! Dinner is served! If you’re trying to cut back on calories you can skill the puff pastry and just serve over rice or pasta… but the puff pastry is amazing. Who doesn’t love a flaky pastry?! All you have to do is make a few cuts and then fold the out side strips up on the adjacent edge creating a little well to put the chicken in after it cooks. Now I want to eat all my dinners with puff pastry! 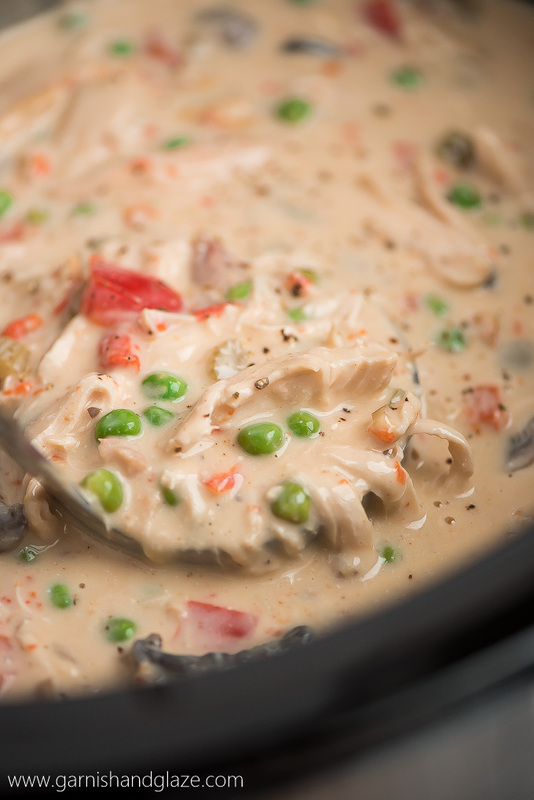 This creamy chicken and veggies is a dream! You’ll want to eat two portions! And you’re kids will love this too! My girls even eat up all their veggies when I make this. I think it has something to do with the creamy sauce that covers them. Mix onion, celery, garlic and water together in a bowl. Cover with plastic wrap and microwave for 5 minutes (stir halfway through) until onions are translucent. 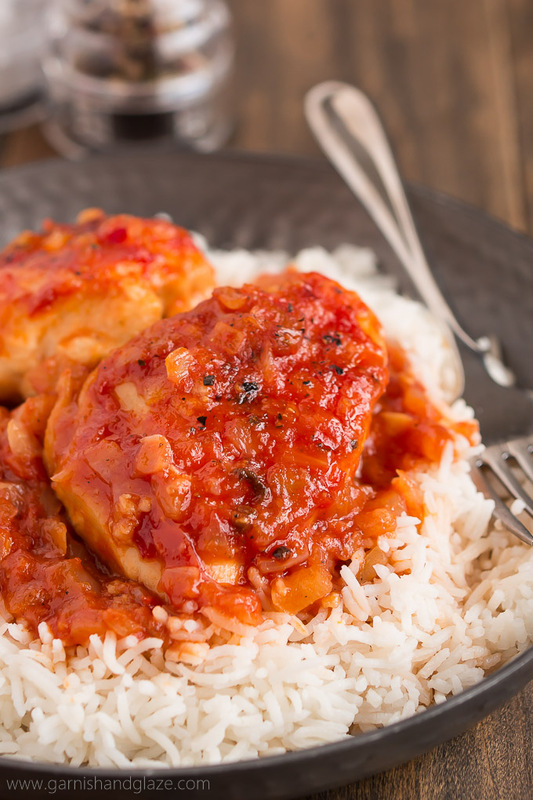 Place chicken in the bottom of a slow cooker and sprinkle with seasoned salt. Add the onion mixture, bell peppers, and mushrooms. Mix the soup and chicken broth together and then pour in the slow cooker. Cover and cook on low for 4 hours. Mix the cornstarch and water together in a small dish and add to the slow cooker along with the cream cheese and peas. Mix in and cook for 30 minutes, uncovered. Meanwhile, make the puff pastry. Grease a baking sheet or line with parchment paper. 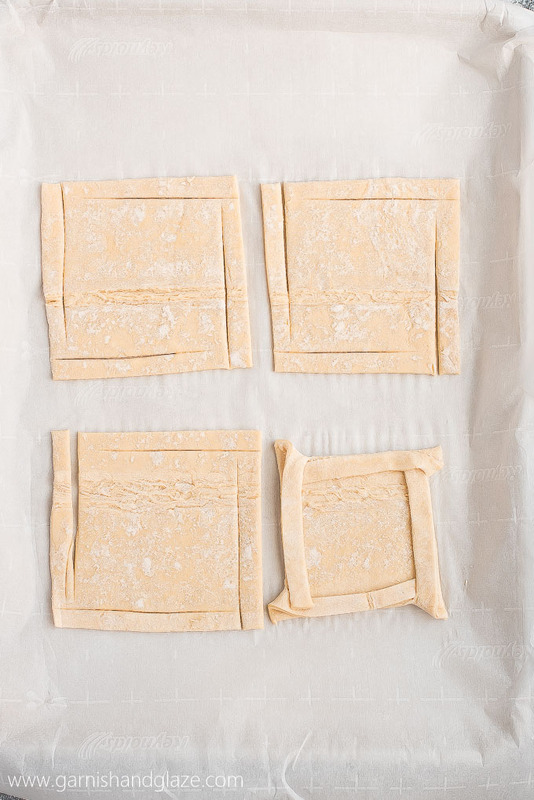 Unfold the pastry sheets and cut each into 4 squares. For each square, cut a thin strip almost all the way through on each side. Wet the dough with your fingers and then pull each thin strip onto the adjacent edge and lightly press down. Continue with each square. Mix the egg and water together and then lightly brush the square with it. Bake for 12-15 minutes at 400 degrees until puffed and golden. Shred the chicken (I just shred it in the slow cooker but you can remove it and add it back). 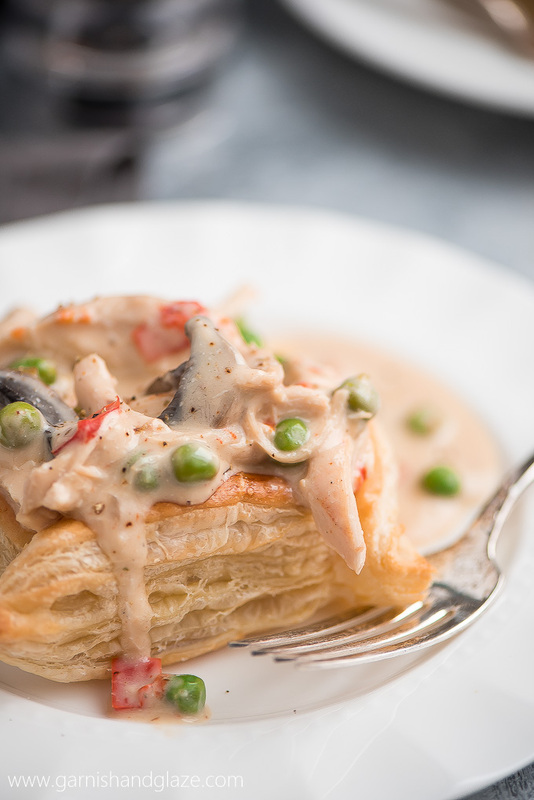 Spoon the chicken mixture over each puff pastry and serve. This looks amazing! We’ve never made anything with puff pastry before, but all the recipes I see using them look so good! You’ll definitely have to try it soon then! You’re missing out, puff pastry is the best! My husband has a cheese allergy, do you think it would work if I substituted the cream cheese for sour cream? Really want to try this!! Yes! It will probably be thinner so you might want to increase the cornstarch/water. Let me know how it goes! my chicken was so where done after 3 hours on low & I used smaller chicken tenders to ensure it cooked faster at such a small amount of time. Is the 3 hours on low a misprint? I checked the temps at 3 1/2 hrs in and they are only at 141 F. They’re currently being broiled in the oven at 525, hoping they’ll hurry up and get to temp. Lauren, I’m sorry you’re having trouble with this recipe. I always cook my chicken breasts in the slow cooker (I have two) on low for 3-4 hours. Did you put the chicken in frozen? Did you spread it out in an even layer? Did you put more than 1 1/2 pounds in? Maybe there’s something wrong with your slow cooker or maybe it just cooks slower? I haven’t frozen it but I think it would do fine, like soup.